Why sacrifice style for warmth? 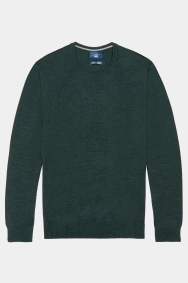 Add this Moss 1851 crew-neck jumper to your wardrobe and you can count on being sharply dressed whatever the weather. Made in Italy from the finest merino wool, this luxurious piece of knitwear can be easily slipped over a formal shirt. With its subtle shade and versatile collar, it’s more than capable of cutting it in the office or on a night out. Go bright and bold with your trouser choice to inject some added flair to your outfit. Perfect Colour & Fit for a great price too.